...and the authors are none other than our own Cyndi and George Marks! ​Bats of Florida provides a careful and complete description of each of Florida's bat species, including its foraging methods, range, roosting habitat, reproductive behaviors, and echolocation. 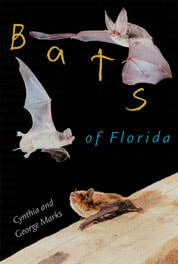 This is the first book dedicated solely to bats in Florida, and it features color photographs of each species, numerous black-and white photographs, drawings, tables, charts, range maps, and an illustrated key for identifying Florida native species. With more than 15 years of experience working with the state's flying mammals, Cyndi and George have cared for and rehabilitated hundreds of injured and orphaned bats. Founders of the Florida Bat Conservancy in 1994, they translate their experiences with bat and people into an objective view of bats and human health, dispelling misunderstandings and separating realistic concerns from exaggerated fears. Bats of Florida also reveals the intriguing stories behind the unoccupied bat tower at Sugarloaf Key and the successfully occupied University of Florida bat house, the largest bat sanctuary of its kind in North America. ​"I truly hope government agencies will use this book as an informational resource when advising the public about bats," Cyndi said. "My greatest wish is that this book will change peoples attitudes about bats and dispel the fears and misinformation many have about these amazing animals."